Former president of Asom Sahitya Sabha, an apex literary body of Assam, Dr Nagen Saikia, has been selected for Sahitya Akademi Fellowship on Tuesday. The Sahitya Akademi Fellowship is an Indian literary honour bestowed by the Sahitya Akademi. Dr Saikia recently decided not to be part of the Centre’s nominated committee to access the implementation of the Clause 6 of the Assam Accord. Most of the people nominated for the committee by the central government refused to be part of the committee as a mark of protest against the government’s move to get Citizenship (Amendment) Bill, 2016 passed in the Parliament. Talking to Northeast Now, Dr Nagen Saikia expressed happiness after being selected for the Sahitya Akademi Fellowship. “Today at around 2 pm, the secretary of Sahitya Akademi, K. Sreenivasa Rao called me over the telephone and said that a meeting was held where my name was selected for Sahitya Akademi Fellowship. My happiness knows no bound because it is one of the prestigious honour given by Sahitya Akademi,” said Dr Saikia. Dr Saikia is the fourth person from Assam who has been selected for this fellowship. Earlier, Bagmibor Nilmoni Phukan (1973), Sayed Abdul Malik (1999) and Nilmoni Phukan (2002) were bestowed with the prestigious honour by Sahitya Akademi. In 1997, Dr Saikia was conferred with Sahitya Akademi Award for his short story collection ‘Andharat Nijar Mukh’. 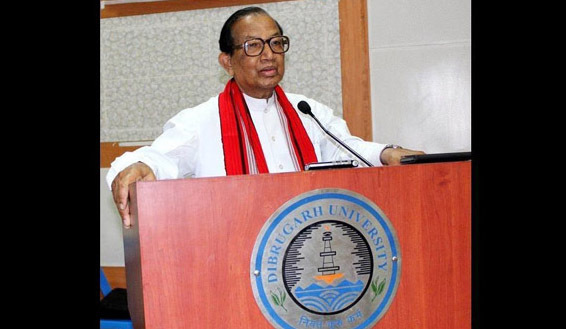 Dr Saikia has been conferred with many other prestigious awards. The fellowship was established in 1968 and is limited to twenty individuals at any given time. In 2016, the fellowship was conferred to 92 writers. The second president of India, Sarvepali Radhakrishnan was the first recipient of the Sahitya Akademi Fellowship in 1968.